order now Words can empower student-athletes to achieve great accomplishments. 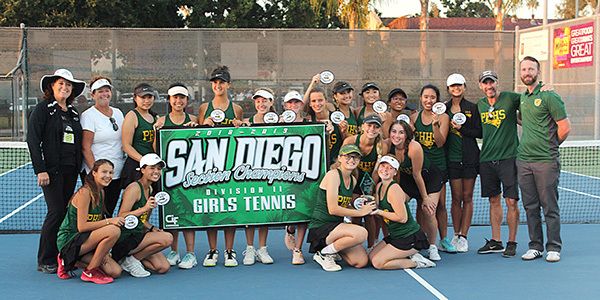 Just ask the Patrick Henry High Girls’ Tennis Team, which won its first ever CIF Championship by believing in the “Power of One.” The Lady Patriots were recently honored by the San Diego Board of Education for their amazing achievement. 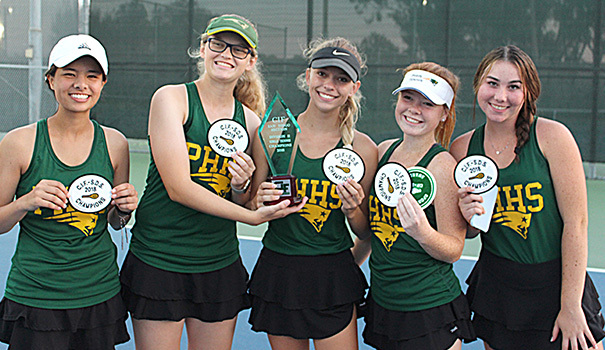 Patrick Henry opened its doors in 1968, and this is the first time in the school’s 51-year history that the Patriots brought home a girls or boys tennis title. order now “Nothing makes me prouder than standing up with our athletes in front of the superintendent and board members as they highlight the good things that are happening at Henry,” said Patrick Henry High Principal Listy Gillingham. In 2017, Patrick Henry suffered a winless season with a 0-10 record. One year later, the Patriots’ mission was to have fun and improve “just one ball at a time and one point at a time.” This “Power of One” mantra allowed the team focus on the present. That simple goal helped change their mindsets to win the Eastern League Championship with a 12-0 record, 17-5 overall. It was the school’s eighth league title in 11 years. Patrick Henry faced El Capitan High in the CIF Division II final at Balboa Tennis Club. It was their second meeting, with El Capitan being the victor, 12-6, in a well-fought preseason battle. Two months later, the two schools proved to be of equal skill in the CIF final and they tied, 9-9, in matches. The tiebreak was determined by a game count in which Patrick Henry edged El Capitan, 73-67, by a slim margin of six games. The CIF Sportsmanship award was given to No. 2 singles Tolley, who was selected by the El Capitan squad. The team’s success was a total effort given by 17 girls at each of the practices and matches. Leading Patrick Henry at No. 1 Singles was junior Olivia Tracey, who was the Eastern League Singles Champion and the League’s Player of the Year. She had a stellar season with an overall record of 26-0 dropping a total of four games. She was named the Union Tribune Athlete of the Week and 97.3 The Fan Athlete of the Week. Tolley excelled with a 32-1 League record, and the No. 3 singles was shared by freshman Angie Bertino (17-2), sophomore Dana Bui (14-5) and sophomore Jamie Weiss (13-6). A great deal of Patriot Henry’s success was due to outstanding doubles teams. Junior Michele Nguyen and freshman Skyler Hilmer (22-1) were the Eastern League Doubles champions and the league’s Doubles Players of the Year. The spotlight was shared by teammates and senior captains Avery Swain and Amanda Martin (22-0), who finished second in league. The No. 3 dynamic duo of junior Hannah Albright and freshman Laura Burger (25-0) placed third in league. Other strong teams in the lineup were junior Donna Tran and senior Jonna Carey, seniors Amy Nguyen and Julia Hong, and freshman Chloe Yacoub and sophomore Mackenzie Smith. In total, the Patrick Henry swept the league singles and doubles titles, as well as earned eight All-Eastern League honors received by Tracey, Tolley, Swain, Martin, Nguyen, Hilmer, Albright and Burger. All juniors and seniors on the team earned Union Tribune All-Academic Team honors with a 3.0 Grade Point Average or higher. The Patriots’ success on the court, however, was complimented by their off-court team chemistry, spirit and friendship. The squad had five outstanding leaders in co-captains Tolley, Swain, Martin, Albright and Tracey. That magical balance and “family” unity was developed through team bonding activities such as the Varsity and Junior Varsity Big Sis-Little Sis mentoring program and Secret Pals, an inter-squad gift exchange. The athletes also adopted positive and motivational “warrior” names to enhance their competitive spirits. —Karen Ronney is a USPTA and PTR certified teaching professional, the Patrick Henry High Girls’ Varsity Coach, and she is San Diego’s Tennis Service Representative for the Southern California Tennis Association.